Every gardener in the depths of winter, wants to bring spring in and relieve the monotony of dreary, dull winter days, without flowers. The garden is lifeless, snow-covered and icy, and you need your drug fix of color and fragrance to help you get through the winter. What is a gardener to do??? An easy solution, short of buying your own greenhouse of flowers, is to plant bulbs inside that will emerge and bloom in a couple of weeks in the depths of January and February. 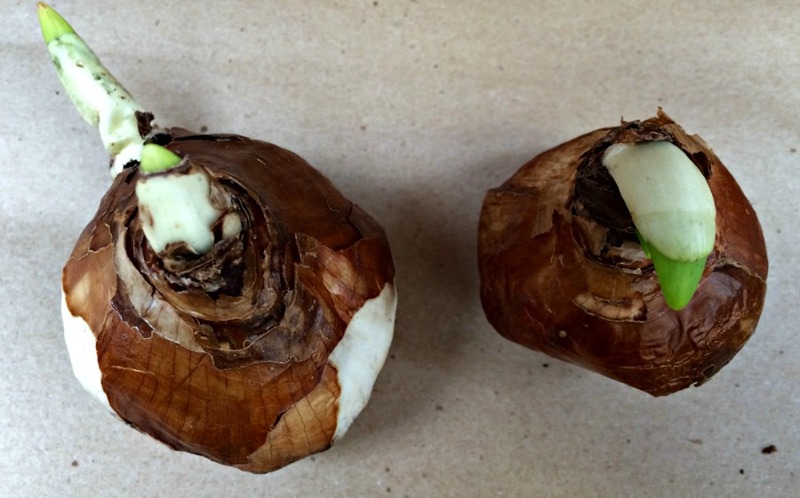 But to get those quick results, you need to force certain varieties- Paperwhites, Amaryllis, and pre-chilled Hyacinths. Forcing bulbs is a technique that has been in use for hundreds of years, popularized in the Victorian era, and the Victorians went to great lengths to force bulbs into bloom. 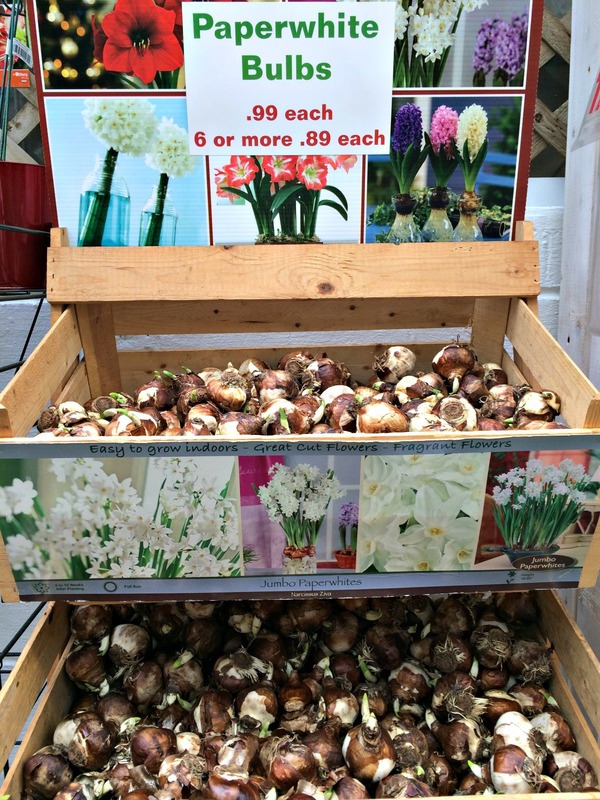 The proper definition of forcing bulbs is defined as “a technique that imitates the environmental conditions that bulbs encounter outdoors, thereby tricking them into flowering earlier”. Different types of bulbs require different chilling periods, generally between 12 and 16 weeks. 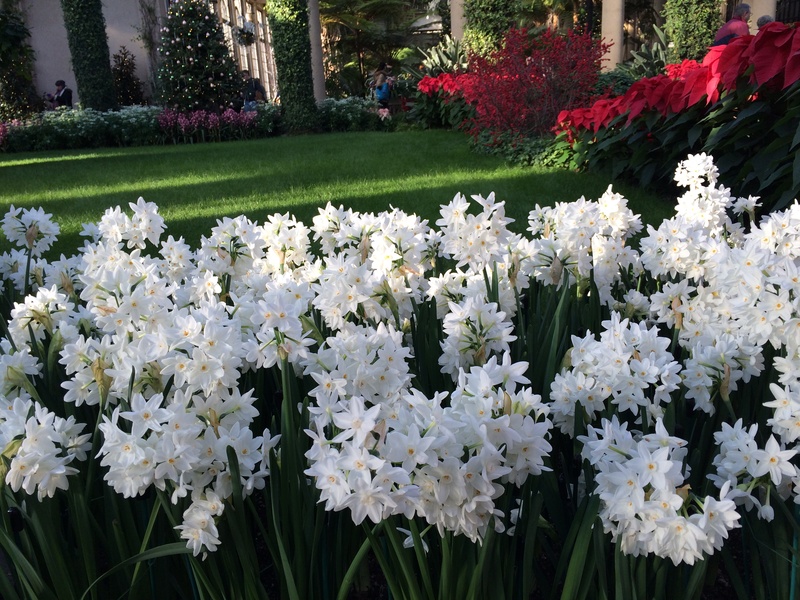 But for Paperwhites and Amaryllis, they are primed and ready to go without this artificial chilling period, and that is why gardeners depend on them for easy winter color. To have Tulips, Crocuses, Iris, and other bulbs blooming in my house in the winter, I would have had to pot the bulbs up in the late fall, chill them in a refrigerator for weeks and weeks, and then bring them into the house for warmth to bloom. But, I don’t have the time or room for that, so I do the next best thing – force the easy ones quickly without much fuss or mess. At a local nursery, I also discovered a treasure trove of Hyacinth bulbs that were pre-chilled and I snatched those up to force also. 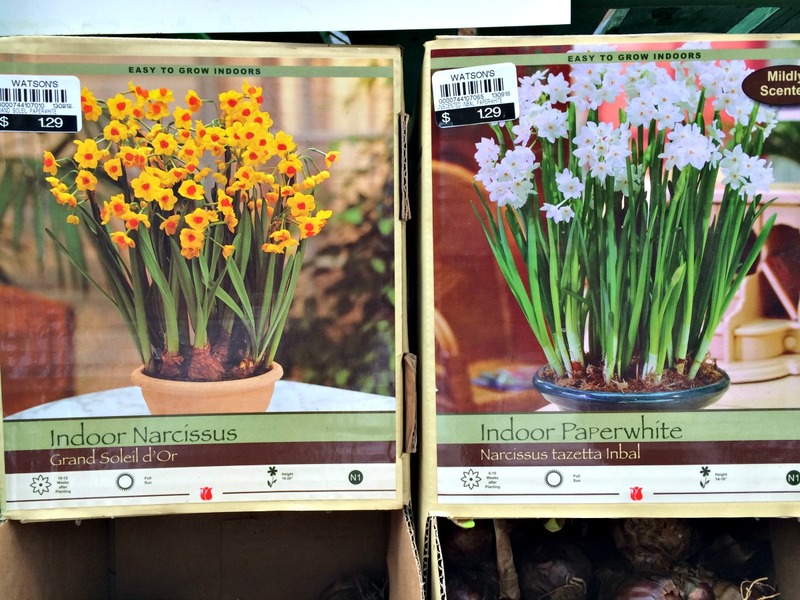 Paperwhites are the most commonly forced bulb that gardeners love to grow and enjoy for their wonderful fragrance. The scent of a bowl of Paperwhites in full bloom will waft through an entire house! They are incredibly easy and bring a touch of much-needed spring scents into your living space. When choosing your bulbs, select ones that are symmetrical, rather than ones that have off shoots, as these tend to come out lopsided and will fall over easily. I like to put my Paperwhites in gravel so that they are bottom heavy and won’t flop over from the weight of the tall stems. Simply fill a container with loose gravel or pebbles, or soil. If you pot them in soil, water until moist. If you use gravel, fill up the container with water until the level hits the bottom of the bulb, but they are not submerged. Keep your paperwhites in a warm sunny spot and check the rooting container almost every day for formation of roots, adding water as it evaporates. Once the shoots reach 2 inches tall, you need to pour off the old water and add a mixture of 4-6 % alcohol and water. You need to do this to stunt the growth of the stems which can get quite tall. You will end up with drunken Paperwhites! The alcohol mixture will shorten the stems by one-third and not affect the flowers at all. See below for the recipe. 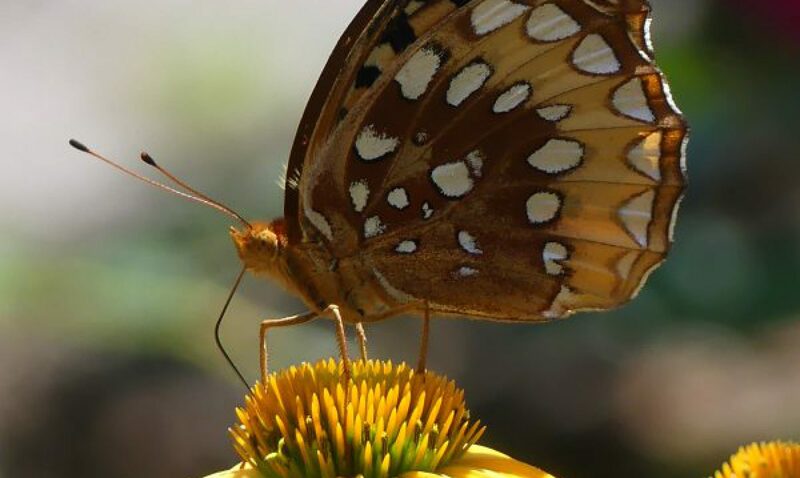 Once in bloom, if you move them to a cooler location, the flowers will last longer. I thought that adding alcohol was an old wives tale, but scientists have proved the veracity of this claim. 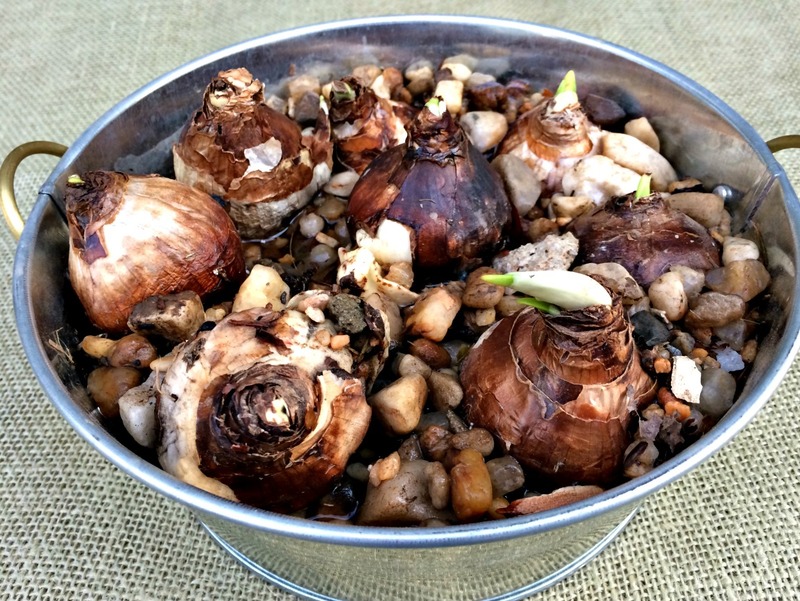 Go to, http://blogs.cornell.edu/hort/2009/11/10/pickling-your-paperwhites/ . Basically, if you add 1 part of gin, vodka, or other alcohol, to 7 parts water, the mixture will interfere with water intake and you end up with shorter and less floppy stems. As anyone who has grown these bulbs knows, a container of fully grown Paperwhites needs support or the whole thing will topple over. The key is to add this mixture after the shoots reach 2 inches tall. Do not use wine or beer!! as that adds too much sugar. Don’t go over this amount of alcohol (4-6%), or you could really damage the plant. If you decide not to add the alcohol, you will need to add some support to the stems. I like the old-fashioned variety Ziva for the great fragrance and pure white color. Also, for those who can’t stand the intense fragrance, there is a variety that is only lightly scented called Tazetta inbal. Personally, I love the strong Paperwhite scent and would never plant the lightly scented variety as that is the main reason I grow them. Another variety to try, is a beautiful sunny yellow with an orange center, called Grand soleil d’Or. 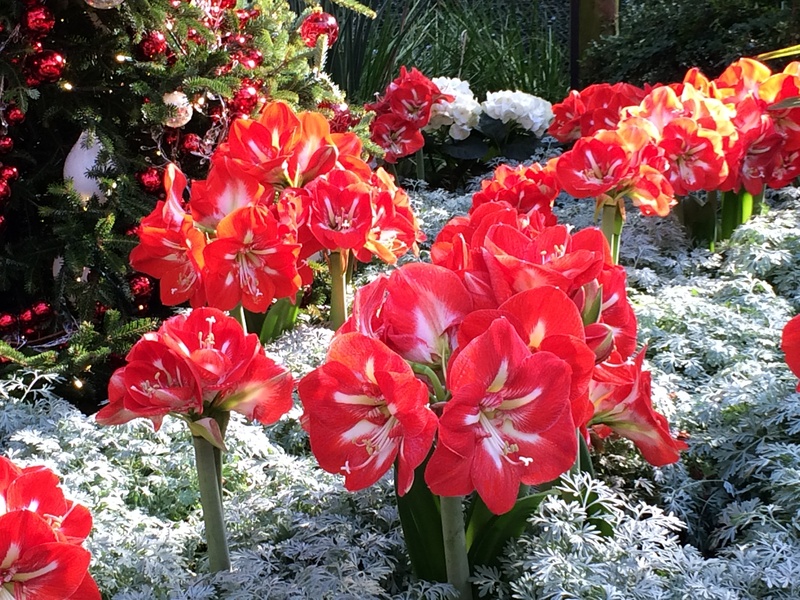 If you have read this blog at all, you probably have figured out that Amaryllis tops my list of favorite plants. Go to Amaryllis Centerpiece or Amaryllis Primer to see what you can do with this easy to force bulb. I love the fragrance and color of Hyacinths, so am forcing these for the first time. I found some pre-chilled bulbs at the nursery along with some forcing vases and thought I would give it a whirl. The trick here is to set the bulbs directly above the water, but not touching, so that the bulbs don’t rot. If you can’t find pre-chilled bulbs, place them in your crisper drawer of your refrigerator for at least five weeks, keeping them away from your produce. Fill the forcing vase to just below the cup where the bulb will rest. The bulb will reach for the water. 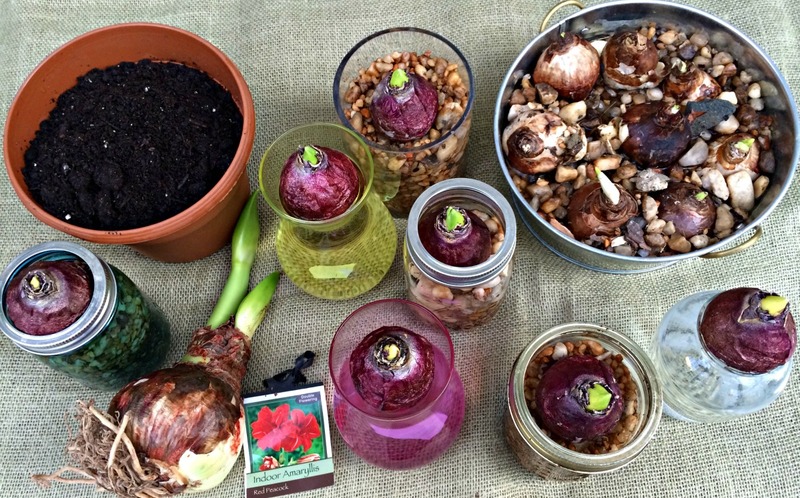 Some of my bulbs I set on gravel in a mason jar with the water level just below the base of the bulb. Place the hyacinth bulb with the root end down and growing tip up, so that the base is just above the water. Place your vase on a bright windowsill and periodically change the water, and turn the vase to keep it centered. Enjoy the two-week show of beauty and fragrance. I especially enjoy watching the roots form through the glass! Paperwhites and Hyacinths pour all their energy into blooming and are all bloomed-out afterwards. I toss them. Amaryllis are a different story. After blooming, I cut off the stalk and water it just like any other houseplant. In the spring when all danger of frost is gone, I stick the pots outside in a sheltered location, in partial sun. I ignore them all summer long, until the fall, when it gets chillier. Then, I bring the pots in and put them in the dark basement and let the leaves die back. Around Thanksgiving, I start watering the bulbs and bring them into the light. Usually they reward me by sending out buds and begin their cycle again. There is a lot of wonderful information here. Thank you. Happy New Year too. I enjoy forcing bulbs especially Paperwhites. I love the canning jar containers ~ I’ll have to try that. I’m the only one in the family who seems to appreciate their lovely scent. Thank you ~ great post! You either love it or hate the scent of paperwhites! Thanks for reading. I’m forcing hyacinths right now. I just put the bulbs in a brown paper bag in the fridge. Do I have to have them in soil? Previous PostPrevious 2013 in review Happy New Year of Blogging! !